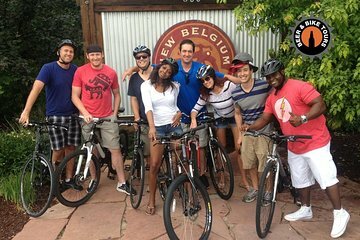 Fort Collins ist eine der originellsten Bierstädte Colorados und der beste Weg, um die Stadt wie ein Einheimischer zu erkunden, ist das Fort Collins mit dem Fahrrad. Steigen Sie vom bequemen Sitz eines Strandkreuzers aus zwischen mehreren Fort Collins-Brauereien und probieren Sie die Auswahl an Bieren. Im Korb vor dem Fahrrad ist sogar Platz für einen Growler oder einen Sixpack. Ein einfaches, mildes und leckeres Abenteuer. Dies ist eine der besten Möglichkeiten, Fort Collins zu bereisen und auch seine Biere zu probieren. WE LOVED OUR BIKE/BREWERY YOUR!!! Bob our guide was amazing. When we would stop at a brewery and get beers we would just hang out and talk. Felt like we had known him for years. The ride was nice and relaxing. All of the breweries had something unique to them, they weren't all the same which was nice. Great beer too! Always found at least one at every place we enjoyed. We loved doing the tasting flights so we could taste a little bit of everything they offered. A fun way to spend an afternoon. Our tour actually ended up visiting a 4th brewery not on the original itinerary at no additional cost! Tours can absolutely be customized to your tastes, The guides can provide some informed suggestions for beers to try based on your interests. We went to Odell, New Belgium, Horse and Dragon, and Snowbank. The riding was flat, easy, and a pleasant cruise. Fun beer cruise. Visited New Belgium, Horse and Dragon, Snowbank, and Odell. Our original itinerary was only 3 breweries, but we got a 4th visit at no additional cost! The guides can offer suggestions for beer based on your personal interests and most everything can be customized to your specific tastes. I wholeheartedly recommend the Sad Panda at Horse and Dragon! such a great time, easy and super fun!